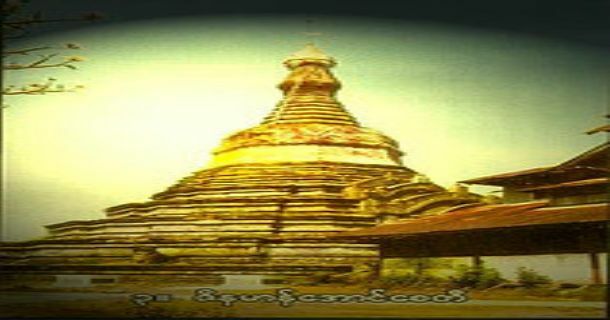 Zinamanaung pagoda is half a mile far away from the palace site and stands on Pantein hillock. King San Da Thu Da Ma Ra Zar ascended the throne of Mraukoo in 1652 AD. Firstly, the king built a pagoda just after he had ascended the throne. And then, the children shouted out that the good deeds done by the king on Pantain hill, were not worth to say “well done.” When the king heard those words, he consulted with the wise ministers. And, they spoke to the king humbly that the pagoda the king built, was very small, therefore, the Devas called god, made the children speak out to remind the king. As the king felt embarrassed about those words, he built another big stone pagoda near the former pagoda in AD 1658. The pagoda is an octagonal structure at the base and the guinea pigs which have single heads and double bodies, are at the corners. The entrance of the cave is in the east to enter the perfumed chamber. In the past, the bronze Buddha image was in the perfumed chamber. Nowadays, the brick Buddha image was placed in the place of the original Buddha image which was taken away by the British force. The five-tiered porches are above the entrance of the cave, and the guinea pigs were sculpted at the corners of the second terrace. The board of trustee takes care of the pagoda.